+ Do you use brushes? Are you touchlesse? Lyon Auto Wash Utilizez soft cloth in order to be safer on your cars finish, it is safer than hand washing your car or going to a touchless car wash that uses harmful chemicals. soap, washed, polished, rinsed, and blown dry with up to eight air dryers. + What is Triple Coat ? Triple Coat treatment is three coatings of polish, each a different color. The Triple Coat enhances the paints shine and adds protection. It contains polymer protection that bonds to the vehicles paint and clear coat. great gifts for others as well. Give them as gifts for • Birthdays • Christmass • Fathers Day • Bosses Day • Valentines Day, and more! Lyon Auto Wash accepts Visa, Master Card, Discover Card, and american Express. However we do not accept personal checks. + Are my Tires too wide? Tire width must not exceed 13.5 inches. + Is my vehicle too tall? Your vehicle can not exceed seven seven feet two inches. 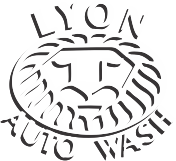 Lyon Auto wash is open 7 days a week, including all holidays.